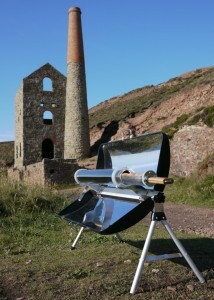 The materials and techniques of solar cooking are modern and mostly unknown in the UK. Solar energy is free and renewable, why waste fossil cooking fuels on a sunny day when you an cook with basic physics? eat as you learn!. Our research indicates that family scale solar cooking is viable in a UK climate. Each time you cook solar you save on costs and reduce demand for fossil fuels. By raising awareness we’re promoting techniques which could travel across a planet where 3 billion people use firewood and charcoal to cook, deforesting whole regions in the process. Join us as we develop methods and technology for solar thermal cooking and food processing in the UK, we welcome all contributions wherever you are. Be an ‘early adopter’ of this technology to cook using the sun in your location, we would love to hear from you.